I LOVE statement earrings, and jewelry that speaks for itself. I have such a fondness and appreciation to for artists who work by hand on their creations. Let me introduce you to this wonderful artist- Diana Ferguson, who hails from Phoenix, Arizona, where she hand makes her beautiful, original “works of art” . I’ll be showing you how I styled her Enchanted Gardens earrings, the ones I selected from her Petals to the Metal Collection, as well as a pair from the Iced Petals Collection. 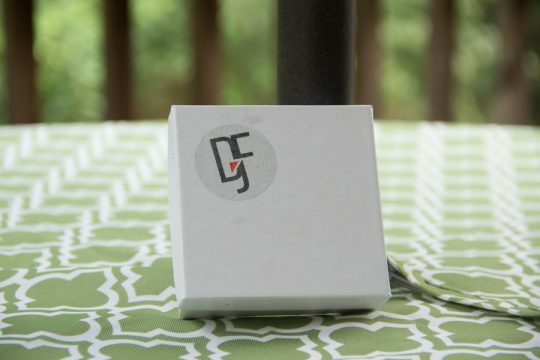 At the end of the post, there is a discount code for you as well. “Cotton rag watercolor paper is hand-patterned using original acrylic films, cut and dapped to shape and then glazed with a glossy enamel finish. The pattern-centric petals are then set with anodized aluminum and layered to create shapes in varying lengths and sizes that are stunning from every angle. 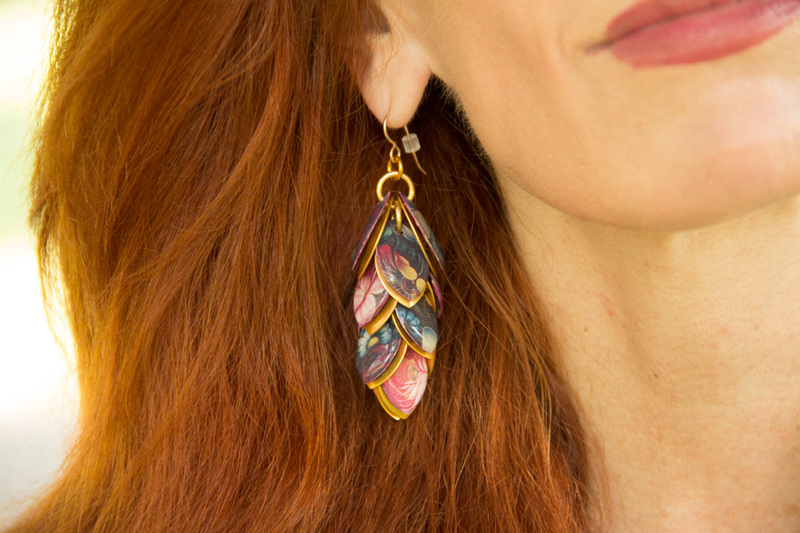 Based upon works of art or inspiration, these statement earrings will get your noticed! I had been debating between two styles. For a personal standpoint, I love the “You’ve Got Music in You”, as a musician and former music teacher, yes! I do! And through hearing about how much and diverse my love for various musical styles are, I was tempted! 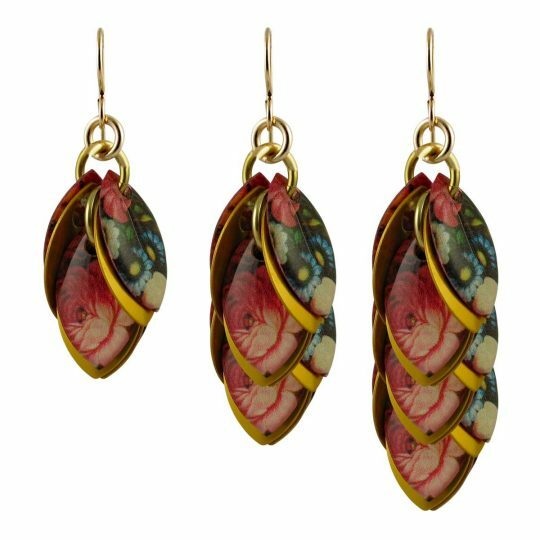 I picked the “Enchanted Garden” earrings with tones of blues, burgundy and golds – a vintage vibe is something I am quite fond of and the antique backing gold petals drew me in. I was very excited to style these! You see, I have a bit of a romantic style, someone once told me.! These earrings are very romantic and perfect for year round styling. I just love these earrings and appreciate artwork and having these very distinctive pieces to add to my jewelry collection. What else do I love about these earrings? They are light! No, heavy adornments on this girl’s ears! I was quite excited to wear them out for the evening to dinner, with this dress. With the image of “Enchanted Garden” in mind, we used the trail and woods behind our house. I chose one of my favorite dresses from Zara’s 2017 collection, and thought it was a perfect look with these Diana Ferguson earrings. It was like the earrings belonged with this dress! A romantic look, I added a touch of whimsy with a plum blocked heel shoe from Jambu, as it wasn’t the expected delicate heel. 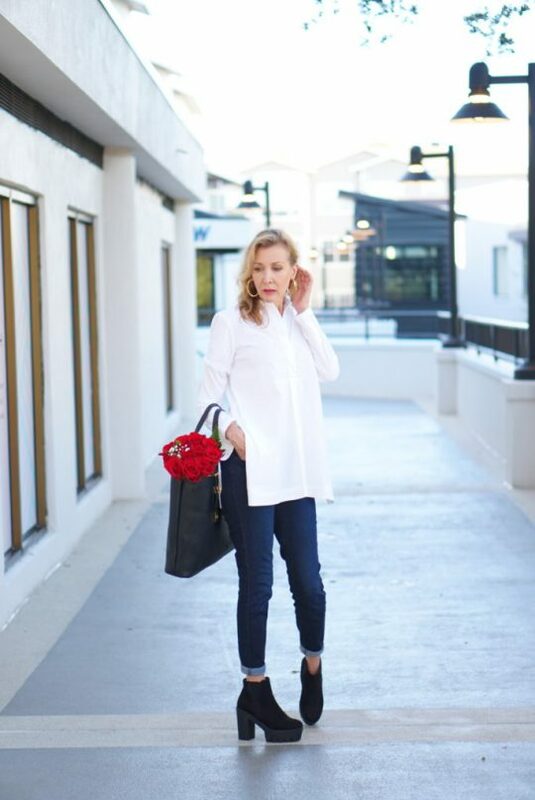 The Anthropologie denim jacket made the look a bit more casual. How would you tell this story by looking at the photographs? I also loved the colors and shine to this collection. My eyes were drawn to the copper, mustard and green shades and thought they would look beautiful against my hair. 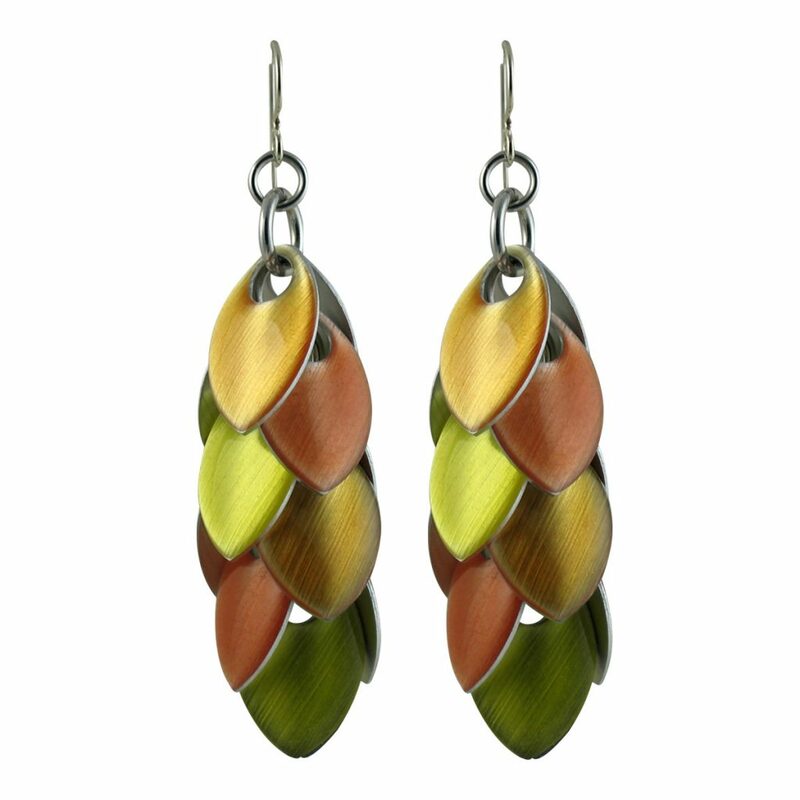 These Ice Gelato earrings have silver petal backings and beautiful intermixed colors that are stunning. I chose the 3″ length, as I love a longer earring with my long hair. Both earrings sets are beautiful, with the Enchanted Garden characterized as a romantic piece of art. The Iced Gelato is shiny, vibrant and modern with it’s silver leaf petals. I look forward to wearing them as well. 3″ long. Length measured from top of ear wire. c/oBoth sets of earrings were gifted to me by Diana Ferguson. All opinions are my own and truthful. 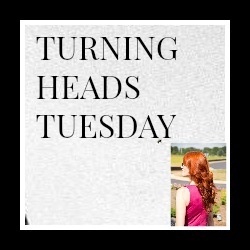 TIME TO PARTY AT THE TURNING HEADS TUESDAY LINKUP! PLEASE, AS YOUR HOST, I WOULD LOVE FOR YOU TO FOLLOW ME ON INSTAGRAM. I ALSO ASK THAT YOU SHOW KINDNESS AND COMMENT ON SEVERAL BLOGGERS PER PERSON. YOU MAY MAKE SOMEONE’S DAY! THANK YOU FOR YOUR COMMENTS! Your dress is beautiful Jess. Just the kind of dress I would go for. Love your earring too. I need to start wearing pretty earring again 🙂 Thanks for sharing at #CreativeMondays, hope to see you tomorrow for our next blog hop. Stunning artistan crafted earrings. You wear them beautifully with your Zara dress in such delicate florals. I love the denim jacket you added to toughen things up. Also, those burgundy suede shoes are the perfect touch for an autumnal vibe. Those are simply beautiful earrings. The dress is very pretty as well. What a romantic fall ensemble. 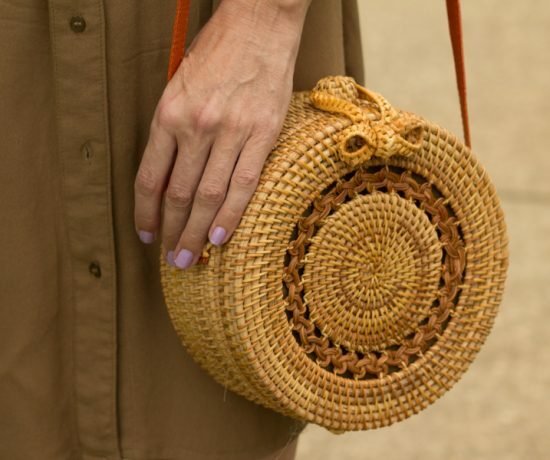 I love handmade one-of-a-kind wearable art pieces. I used to make them myself. Be safe during the storm! How pretty are these?! And that dress? Gorgeous, the colours and style are perfect for you. Hugs, x. This earrings are so pretty!! Nice design! Your earrings are beautiful and goes really well with your dress! Both are very beautiful and so enchanting! Those earrings are just beautiful! What incredible artistry! I have one of her pendants that is just lovely. Those earrings look perfect with your beautiful dress. Hi sweet Jess!! I’ve been meaning to “visit” with you & I think I picked the perfect time. What a lovely post. These earrings are stunning. And best is that they are handmade. I really love them. Thank you ever so much for sharing them with us. These would make perfect Christmas gifts. (YES, I am THAT girl. Already started myshopping!) I really think the way you styled your earrings is beautiful. That Zara dress…sighing…WOW! Sorry for swooning lady, but you look divine. Hope to visit more often. Take care sweet friend!! I’m a big fan of statement earrings too, and those are really gorgeous! I love your burgundy platform shoes too! I love the dress the colors are wonderful for fall, earrings too!! Such beautiful earrings, the detail in them is exquisite! I love your floral print dress – the earrings compliment it so well. Fabulous berry-toned shoes too! Jess, I’m speechless… you’re like the muse I didn’t know I had! I love, love, love how you styled the earrings. This is a treasure. Thank you. 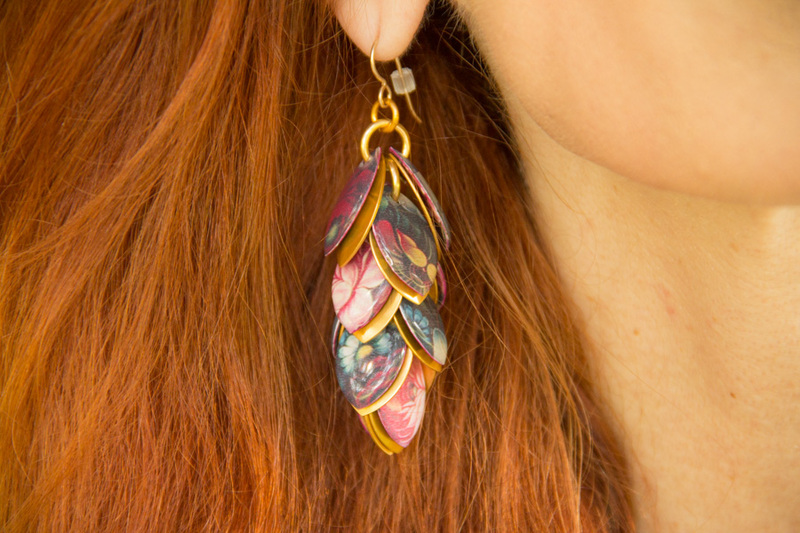 Such pretty earrings and they work perfectly with you fall floral dress. Beautiful colors on you Jess. These earrings look perfect on you ! Beautiful earrings! You set the scene so beautifully too. 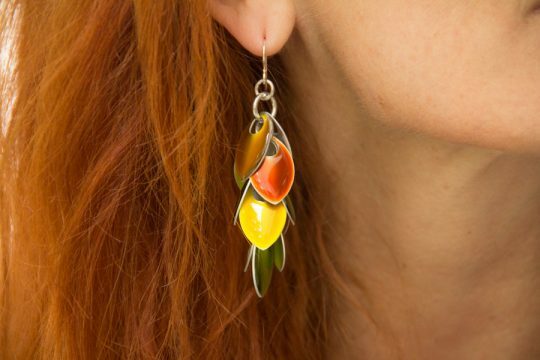 These earrings are so lovely, lady- and I’m digging your fall floral! Everything about this outfit is perfect! I love a good pair of statement earrings like this pair. The detailing is just gorgeous and I love how they dangle! A little summer feeling to them, while the colors scream fall 🙂 Lovely look! Those earrings are beautiful, I love all the details, and I agree they are soooo you! And, so are those fabulous shoes, so cool Jess! These earrings are so pretty and are perfect with your dress! Such a gorgeous look Jess! 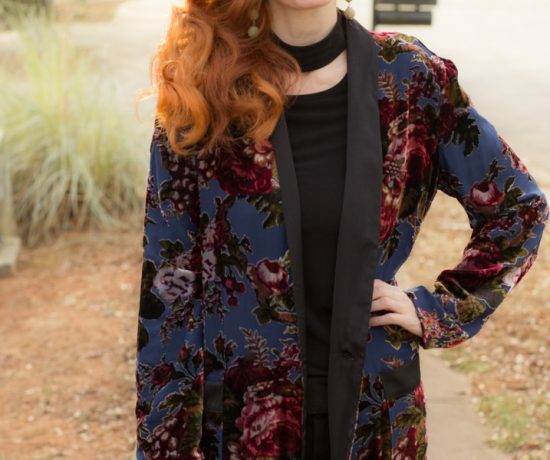 What a perfect fall transitional look. That dress is gorgeous! Love the colors. Such fun shoes. And those earrings, wow! Beautiful. I love absolutely everything about this outfit. You picked the perfect dress to showcase those amazing earrings. They are truly works of art. The romantic vintage floral print of the dress is gorgeous. And the purple suede shoes! Fabulous! Enchanting is right, the earrings and you! Beautiful Jess! Oooh, I love this dress! It would also be so pretty with suede boots! You look so elegant. You got such beautiful earrings and I love the ones you picked. 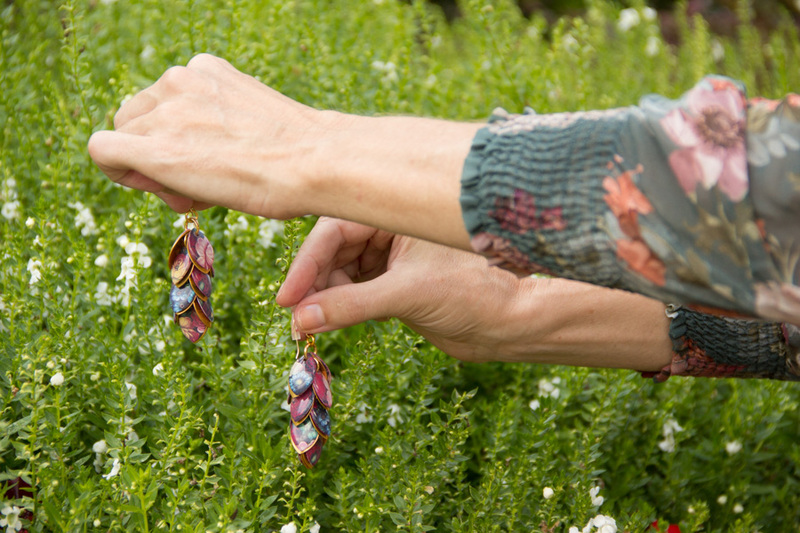 The enchanted garden pair work so nicely with your floral dress! Hope you are having a nice start to your week, and that the storm isn’t as bad as expected! Love the title of the post! Those earrings are so beautiful and perfect with your dress, they look like they were made for one another. Love those shoes with your dress too Jess! My prayers are for Florence to weaken and for all those in her path. I know all too well what that feels like – sitting and waiting for the storm and then all the clean up afterwards. I hope everyone if prepared and stays safe! Those earrings are pretty, but I’m really in love with that dress and those shoes! Good choice Jess, the earrings are really lovely. Your dress and shoes are perfect too. Hoping the storm passes without any damage. These earrings look absolutely gorgeous! I love those shooze!! Preparing for a storm is so very stressful and we have been thru it so many times. I do hope it passes by your territory quickly with no damages. These earrings are so you!